Long Distance is a collection of Filipino audio stories set a long way from home. It is an independent narrative podcast about life in the Filipino diaspora. What does it mean to be Filipino outside of the homeland? To grow up there and to have to leave it? Or what if you’ve never been there at all? Each episode moves beyond typical immigrant narratives to share thoughtful tales of love, loss, history, and humor through audio documentaries and creative approaches to storytelling with sound. The Philippines has one of the largest diaspora populations in the world, and yet these stories are rarely covered in mainstream media. Long Distance is a podcast for the people and stories of this community. This season, Long Distance will share forgotten histories and true tales of Filipinos in America, home to the largest population of Filipinos outside of the homeland. Download/Subscribe: The show is available to subscribe and listen to on Apple Podcasts, Google Podcasts, Spotify, and most podcast apps and platforms. It will also be available on the website. Schedule: Episodes will be released every 15th of the month. Download press kit and media assets here. 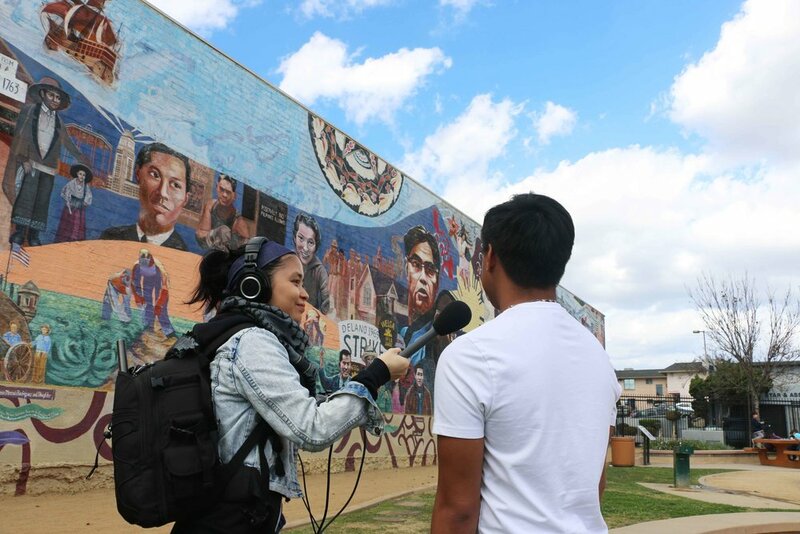 Media assets include main cover art, wide version of cover art, and a photo of host/creator Paola Mardo during an interview in LA’s Historic Filipinotown (photo credit: Patrick Epino). Paola Mardo is the Host, Writer, Producer, and Creator. Patrick Epino is the Co-Producer and Voice Actor. He is a filmmaker and actor whose credits include Bitter Melon, Awesome Asian Bad Guys, and the National Film Society YouTube Channel. Theme song is “Comin’ Along” by C. Light and the Prisms. Title design and episode art is by Paola Mardo. Long Distance is created, written, edited, mixed, hosted, and produced by Paola Mardo, an independent audio producer based in Los Angeles. Her work has aired on KCRW’s Good Food, Offshore, PRI’s The World, and KPCC’s The Frame. She has written stories for Buzzfeed, PRI, and (the old) LA Weekly, and has provided podcast production services for clients including Hulu, Slate, Vox, Wondery, and Western Sound. Paola began her adventures in podcasting as host and producer of F This Weekly. She was a member of the inaugural Third Coast Radio Residency and is an alum of the Transom Workshop. Previously, she was a producer on Democracy in Color podcast and produced interviews and features at KPCC’s The Frame. Before all that, she worked in the film industry at Sony Pictures and Annapurna Pictures. More about Paola Mardo and her work at paolamardo.com. In 2016, I began working on an audio project about Los Angeles’ Historic Filipinotown. After extensive interviews and research, and through my work as a journalist, I saw a great need to tell thoughtful, well-reported audio stories about my community. That’s how Long Distance got started. Recently, Filipino stories have made headlines through food and politics. But there are also more complex narratives about the Filipino experience unfolding beneath mainstream culture – a wave of Filipinos making their mark in art and entrepreneurship, young Filipinos redefining their identities online, and a gap in awareness of the deep history of Filipinos abroad. Long Distance is a place for all of these stories and more. I was born in Los Angeles, but grew up in Manila, Kuala Lumpur, and the San Francisco Bay Area. As a child of the diaspora, I’ve always been interested in stories about people in new places and finding “home,” wherever that may be. Through Long Distance, I hope to capture the sounds of this international community and to tell our stories through creative audio documentaries that open minds and maybe even tickle ears and imaginations.